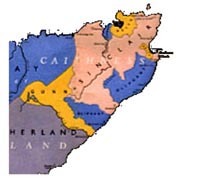 Caithness is Clan Sinclair and Clan Gunn country, and we are members of the Clan Sinclair Society in Caithness. The Sinclairs are like many Scots Clans (including Stewarts, Gordons, Chisolms, Colquhons, Montgomerys and Frasers) are of Norman origin, descended from Rollo, or Rolf the Ganger, son of Rognvald the Mighty, Earl of Møre and Romsdal in Western Norway, and whose son became Jarl of Orkney (including Caithness).The Sinclairs first settled at Rosslyn, south of Edinburgh. By his father William's marriage, Henry Sinclair became Jarl of Orkney, still a Norwegian title on 2nd August 1379. The Lairds of Caithness share a heritage with the Sinclairs and my family is permitted to wear the Sinclair Tartans (Red & Hunting) by the Clan Chief, the Rt Hon The Earl of Caithness PC. The Clan Chief's web site is www.clansinclair.org which links to the world-wide sites of Clan Sinclair. First photographs from Clan Sinclair 2005 International Gathering in Orkney and Caithness.